Overwhelm is quite hard to avoid these days. The web is quite a busy place and there is a lot of information on almost every topic that exists. This is a good thing. Information is good. But too much of anything is not good. And we have got too much of information floating around the web, don’t you agree? Entrepreneurs are one of the major victims of this information overload. Why? Because we are the ones who constantly look for information on the web. Our virtual workspace is on the web and we constantly look up for help. When we learn to blog, we look up for blogging tips. We hunt for blog post ideas. We search for tips on technical skills that are needed to run a blog. Given that there’s so much to learn when we are running an online business by ourselves, we need to keep ourselves updated on news, topics, and all the essentials that are absolutely needed to keep our business afloat. So it is clear that we cannot “escape” looking for information on the web. It is certainly part of our business. But when it goes bad is that when we are choked by the overwhelming amount of information on the web. Here’s why overwhelm is a BIG hurdle to your blogging success! For one, when there’s too much information you cannot use it for good. Too much information overwhelms you and leaves you confused. You cannot pick any one strategy or tip and there’s simply too much to choose from. Overwhelm will make you stressed. There are different ways in which bloggers get stressed over too much information. Some people stress out because they feel that there’s too much to learn and that they’ve only learned very less so far. Some people stress out trying every tip/strategy they look up and end up burned out. Overwhelming amount of information will simply keep you busy for no reason. Following 4, you will not indulge in producing or creating value. You will simply be locked in the mystery of too much information. So how can you overcome this BIG hurdle? This is quite tricky and you need to have discipline in order to overcome information overload, given that it is stopping you from progressing. Let’s dive in. Many bloggers are proud of themselves on the fact (as they believe) that they work extended hours on their business. Most of us (myself included) believe that sitting in front of the laptop is working. Nah! If you are believing the same, you’ve got to wake up! You have to take a closer look to see what kinda work you are really doing while you are sitting in front of the computer. And, researching for a blog post topic is work too. But getting sidetracked a lot in the name of researching is very likely to happen. And, when you end up on a cute cat video when you started researching for a blog post, you cannot count all of the hours as “work”. In the end if you don’t have control of the time you get sidetracked, you will feel overwhelmed with the amount of information you have gathered. There is no point in spending all the time in researching and finally creating nothing. The whole purpose of researching goes waste here. So set yourself a specific time window for researching or anything that involves gathering information. Define your “working period”. Spending all your time on learning isn’t a good idea. You need to allot a major portion of your time to apply what you’ve learned and/or create stuff for your business. I like Rescue Time which helps me track where my time is going. If I unknowingly (or knowingly) spend too much time on an unnecessary task, I can see it in the weekly reports. This will help me get myself back on track! With the premium version, I can also block distracting websites for a specific period of time when I am producing something (more on it in a bit). I see that there is a tendency to end up spending too much time on learning/researching and gathering too much information when I have to do it more frequently. Let’s say I do the research for a blog post and then I start writing it. And then I do research for another blog post and then come back to writing it. If I gather information like this, the chances of taking too much time and info on one researching session are high! On the other hand, if I batch process learning and producing I spend the time more reasonably. And this needs quite a bit of practice too. So carve out a big block of time for gathering information for multiple tasks. Say you have to do research for 2 blog posts, 1 niche site you are planning to start, a market research for one new product and so on. In the big block of time, allot smaller chunks of time window for each of the above researching tasks. Once you have completed gathering information for multiple purposes, use all the information and switch yourself to “doing” mode. Switching back and forth between researching and producing will make you spend too much time on gathering unwanted information. I actually hesitated a bit to use the word “distractions” here. But information overwhelm occurs mainly because of the too many distractions that are on the web and real information is actually buried deep inside. So in most cases you simply have to cut off all the distractions to stop yourself from chocking on information. It is quite natural to land on Facebook when you are researching for something. A search result might lead you there. You might even grab a couple of useful links or videos from Facebook. But then you start scrolling that infinite scroll bar and you start gathering all the unnecessary information. You waste your time and load your brain with garbage that you don’t need. Cutting off distractions is the only way to keep the information minimum and get back to work in time! You could have heard the advice that you should unplug from the internet or block yourself from visiting certain websites while you are writing a blog post or working on a project. Now here’s my advice: Block yourself from visiting certain websites (where you are more likely to get distracted – common, you know them!) while you are in researching mode. You will not miss anything. You will not choke yourself on too much information and you will not get side tracked. There are various apps/software that help you do this. I like Cold Turkey for a rock solid protection against distractions. This program is so robust – it makes it nearly impossible to get around while you are in “block” mode. Or if you prefer, you can also use the pro version of Rescue Time to get this job done. In any case, block yourself from sites that are most likely to distract you and load you with unnecessary information. You will be good in the end. Blogging is a challenging task that needs your consistent effort for a long time. It is a long time commitment and certainly no joke. It is very important to keep yourself “lite” throughout the process because there is already too much on your plate! You got to research the market, find ways to please your readers, do search engine optimization, build email list, connect with people and build your network, create products, consistently create useful content to gain traction and the list is not going to end here – I ended it because my fingers are tired. So there’s already too much that needs your attention. Give your total, undivided attention to those tasks that will grow your business and stop overwhelming yourself with too much information. 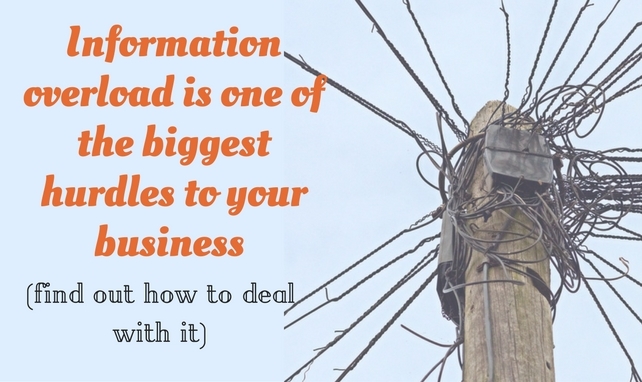 Too much information and overwhelm not only hinders your business growth but can also hit your health. The stress that comes from overwhelm is no fun. Hope you found these tips useful. Share it with your friends and community. If you have a cool tip, share it here in the comments below. Also let me know which one of these tips you found the most useful! Indeed an Interesting Post. I agree with you that Blogging is no Joke and needs serious passion and hard efforts to succeed, so it is vital that we should keep learning, but only to a limit that we should blow our mind. Keeping things in check, can certainly do wonders in blogging. So, thanks for sharing such a post. Hi Jane – I am looking for email subscription for your posts. How do I get latest updates within my Inbox?